We already know that the Netherlands has it all — glow in the dark freeways, clogs, and a dating show dedicated solely to helping lonely farmers look for love. Well, it gets even better: The tiny town of Zundert has elevated the Netherlands game to A+++ will live there forever. 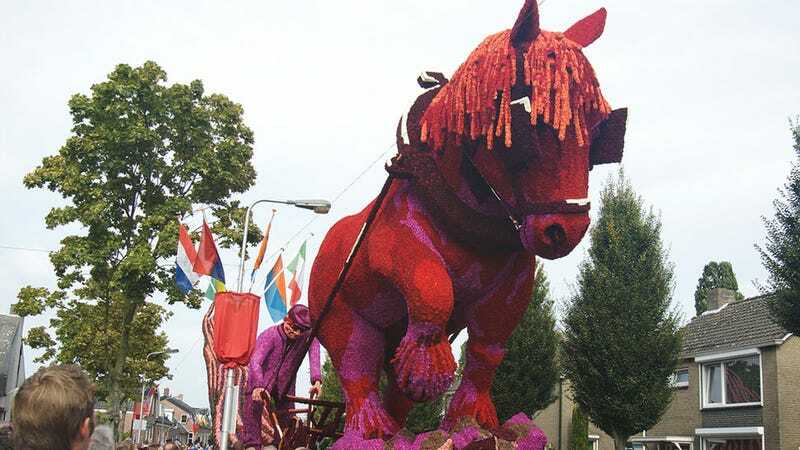 Every year, twenty enormous floats made entirely of dahlias parade down the streets as part of Corso Zundert, an annual flower parade. Duh, what else would it be? Colossal has breathtaking photos of the affair and it makes me want to put on a milkmaid costume and go sit in that giant clog in the middle of Amsterdam whilst drinking a Heineken and yodeling. One dumb American a-hole flower aficionado, coming through!